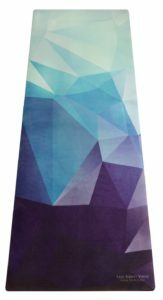 The Free Thirty Three Union Yoga Mat is a solid high-end yoga mat with unique features. It’s special upper layer and gorgeous designs are its strongest points, along with a solid natural rubber base. We’ll provide an in-depth look at this mat so you can decide if it’s the right yoga mat for you. The Free Thirty Three mats have a special design that essentially fuses a yoga towel and yoga mat. The bottom surface is a natural rubber material, while the top surface is an absorbant microfiber suede. The rubber surface provides the firm yet cushioning foundation that grips a hard gym floor, while the upper surface absorbs sweat and provides traction with your hands and limbs. How well does the mat work in practice? The upper layer is super absorbant and easily takes on excess moisture. The grip is superb even under hot yoga or other sweaty conditions. Usually, you would pack a separate yoga towel and yoga mat, but the convenient two-in-one combined construction lets you not worry about that with no sacrifice in performance. All in all, the mat is a solid choice. 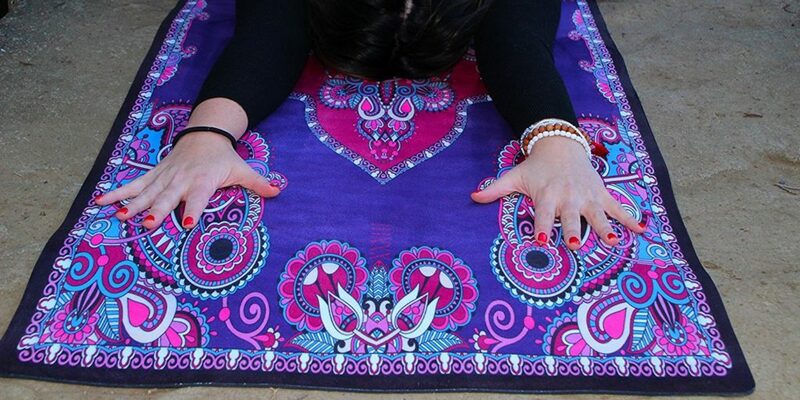 Let’s talk about the real reason you want one of these yoga mats – the awesome designs! Free Thirty Three provides some of the most diverse and terrific yoga mat designs. You can go for a modern look with Gemstones or an old-school exotic Magic Carpet. You really need to check out all the different designs . What’s great is that you get these designs on a solid yoga mat. It’s not just a pretty finish on top. The colors themselves are from nontoxic water-based inks that are fade-resistant. The yoga mat comes with a strap and no bag. With such gorgeous designs, it would be a shame to stuff them into a boring gray bag. We think the mats look fantasic carried with just a strap. The company is eco-conscious, and uses natural biodegradable rubber for the mat base. Furthermore, for every yoga mat you buy, they will plant a tree. This is a bit of a marketing gimmick that other some companies also do, but it doesn’t hurt. You can clean the mat in a washing matchine and hang to dry, or you can use standard yoga mat cleaning sprays. At 70″ x 24″, the mat is a pretty standard size for yoga mats. The Free Thirty Three Union Yoga Mat helps you practice yoga while looking good too! It is a great choice for yourself, or makes a great present when you want something less bland to give. For the premium designs, the price is very affordable as well. Check it out on Amazon .